The Allied Chemical and Die Company discharged approximately 165,000 pounds of mercury into Onondaga Lake between the years of 1946 and 1970. Because mercury in the form of methyl mercury is among the most poisonous chemicals, many negative implications have risen in Onondaga Lake’s history due to Allied’s pollution. In 1940, swimming was banned in Onondaga Lake due to the bacterial contamination. In 1972, fishing was banned. The ban on fishing was due to the mercury pollution. In 1970, the U.S. Attorney General sued the Allied Company. Allied then ceased the discharging of mercury into the lake. Throughout the 1970s, restoration begins. In 1986, the fishing ban was released and changed to a catch and release policy. Throughout the end of the 20th century, clean up continues, and the status of the lake improves, but still has a long way to go. Currently, it is estimated that 7 million cubic yards of lake sediments remain contaminated with mercury. Due to this persistence of mercury contamination, the affected sediments at the bottom of the lake are considered hazardous waste. This advisory shows that improvements have occurred regarding the mercury contamination. Although remediation approaches are still necessary. The U.S. Environmental Protection Agency has suggested that fish with mercury concentrations greater than 0.3 parts per million not be consumed. 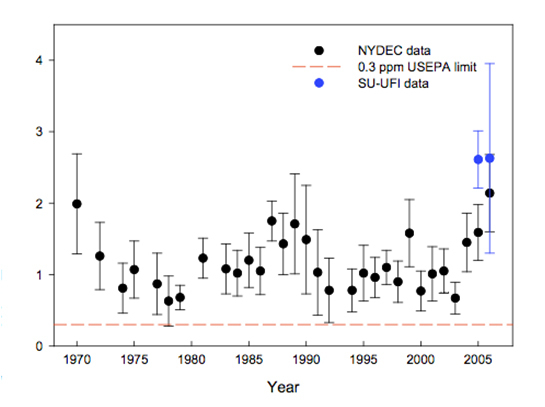 Long-term measurements of the mercury content of small mouth bass in the lake by the New York Department of Environmental Conservation show that concentrations have remained high since the 1970s (Figure 1). However, there have been some improvements in the mercury status of Onondaga Lake. Concentrations of mercury in lake water have decreased. In addition there have been marked decreases in the mercury content of zooplanktin, an important component of fish diet.